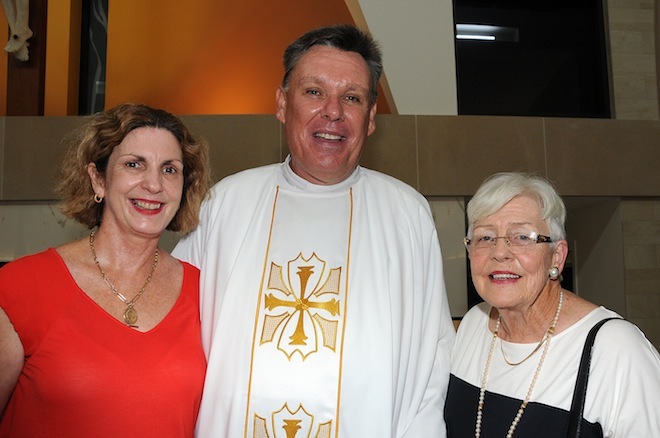 New leader: Townsville Diocese’s Bishop-elect Tim Harris with parishioners. AFTER nearly three years of waiting, the announcement of a new bishop has been warmly greeted across the vast Townsville Diocese. “We’re getting text messages and emails of excitement from all over the diocese,” Diocesan chancellor Len Horner, who over the last 35 years, has worked alongside Townsville’s past three bishops, said. Since the death of Townsville Bishop Michael Putney in March 2014, Fr Michael Lowcock assumed the difficult task of diocesan administrator, while maintaining his parish duties in Mount Isa. Mr Horner described the leadership and unity role of bishop as “pivotal” across vast distances stretching west across North Queensland to Mount Isa and the Northern Territory border. “There was a sense of something is missing when there’s been no bishop at the helm,” he said. Fr Lowcock said he welcomed Bishop-elect Harris to the diocese. “I am very happy with who we are getting, and I can say it will relieve me of a lot of pressure,” he said. Fr Lowcock said about 25 per cent of his parishioners were indigenous, and they should be a focus for the Church attention across the diocese. “We need to grow with a sense of justice, to look into their eyes, encourage them and carry the service,” he said. Townsville Catholic Education executive director Cathy Day is “delighted” with the appointment of Bishop-elect Harris’ after meeting him during a two-week enhancing Catholic education project in Belgium city of Leuven, last year. “He is a lovely warm person. We can’t wait to welcome him to Townsville, to visit schools, and be part of the classes – all the things that bishops do,” Dr Day said. “The bishop is our chief teacher and pastor. “He is the person who can teach children about the importance of the church and the place of the church in our lives, and also the relationship the bishop builds with our schools. “It was not unusual for children on the street to yell out ‘hello Bishop Michael’ from across the road. Townsville diocesan communications and vocations co-ordinator Neil Helmore said the appointment of a new bishop would lift the Church’s “profile and presence” in the broader community and in local media. As a sign of community engagement, Mr Helmore said Bishop-elect Harris had already agreed to change football allegiances on entering North Queensland. “He will be a Cowboys supporter for sure,” he said.